Adult vaccination rates in the U.S. are dangerously low, falling far short of national targets, despite the devastating effects vaccine-preventable diseases can have on older adults. The Our Best Shot campaign grew out of recommendations highlighted in the Our Best Shot: Expanding Prevention through Vaccination whitepaper. Truth About Vaccines Factsheet: Addresses much of the misinformation about adult and childhood vaccinations. Wellness Wisdom Factsheet: Gives an overview of preventive services available through Medicare–including the Annual Wellness visit, the Welcome to Medicare visit, and recommended vaccines. Quick Guide to Vaccination Brochure: Looks at the potential symptoms and complications of vaccine-preventable diseases, the vaccine schedule for ages 60-64 and 65+, and a vaccine-tracker. Also available in Spanish. Pocket Film: Covers how vaccines work, why they’re important for all ages, where to get them, and more. Also available in Spanish, as a 60-second PSA, as a 30-second PSA, and with closed captions. Leader’s Guide: Gives tips and instructions on promoting and conducting a workshop, an agenda, a suggested script, and more. Promotional Poster: Designed to be used to promote upcoming educational workshops. Participant Quiz and Answers: Emphasizes points in the script and helps keep participants engaged. Slide Presentation: Gives visuals that emphasize the workshop script. Evaluation Form: Collects feedback from participants. On-line Survey: Collects feedback from workshop leaders. Watch the presentation from the workshop kit launch, where two leaders from Area Agencies on Aging talk about their experience piloting the workshop kit, and share their tips on best practices. All of the materials are free and we encourage you to download them, save them to your computer, print out copies, and get started on hosting this important workshop! For questions, e-mail Lindsay Clarke at [email protected]. 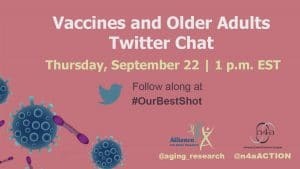 You can also learn more about vaccines by reading the script from our September 2016 #OurBestShot Twitter Chat. 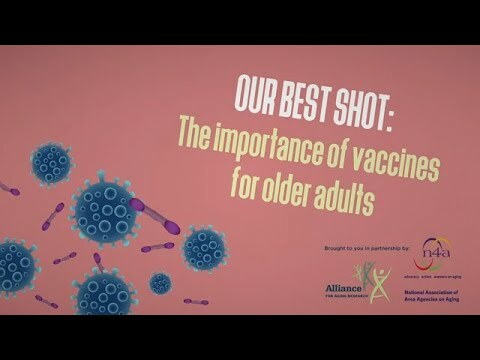 + All documents related to "Our Best Shot: The Importance of Vaccines for Older Adults"